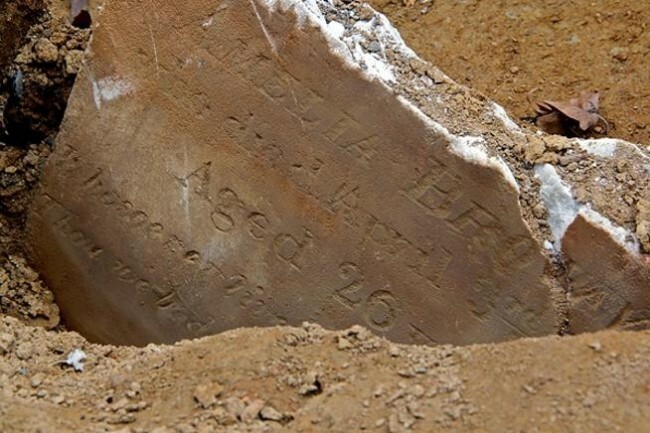 Forty-five- year-old James Milburn died of “Diseases of the Liver and Lung” on January 18th in 1853 and was buried on the 29th at Bethel Burying Ground. The reason for the delay in burial was due to the weather that froze the over the Delaware River and covered the streets in ice and snow. * Mr. Milburn was a “prominent Mason” and his brethren from the city and county” ” . . . with all the honors of the order” marched in his funeral procession from his residence at 197 Lombard Street to the Bethel Burying Ground at 5th and Queen Street. The procession “attracted a great crowd of spectators.”** Mr. Milburn is one of several other Masons that have been identified as interred on Queen Street. It may have to do with the fact that the Reverend Richard Allen was a highly ranked Mason. According to the 1847 African American Census, Mr. Milburn was employed as a barber that owned only $1.50 in personal property (about $40 in today’s currency) and paid $4.00 a month in rent which he shared with another male also a barber. Mr. Milburn stated to the 1847 census taker that he “. . . has two wives both of whom are supposed to be living.” He also stated that he had no religious affiliation. Mr. Milburn was born in Maryland. For further reading on Black Masons in Philadelphia, you can go to pages 280-281 in William Dorsey’s Philadelphia & Ours: On the Past and Future of the Black City in American by Roger Lane. *Daily Pennsylvanian, 18 January 1853. ** Daily Pennsylvanian, 24 January 1853.